We can’t be looking in multiple directions at the same time so we spend the majority of our driving making assumptions about where other vehicles are going to be and what they are going to do. Sometimes, though, these assumptions are wrong and that’s when you put yourself at risk of having an accident. There are tell-tale signs that a driver is going to manoeuvre, though, and there are places you can position your vehicle so that you make it safer for you and them. Position your vehicle where you can see at least four seconds ahead. Ideally you want to be looking four vehicles ahead because that will give you plenty of time to react to what’s happening. If you’re tailgating then you reduce your vision of the traffic ahead of you and that puts you at risk of a nose-to-tail accident. Remember that you can also often see the brake lights of a car in front of the one you are following and that will give you advanced warning, too. If you look at the image of the two trucks, you can’t see what’s going on ahead of the truck in front. 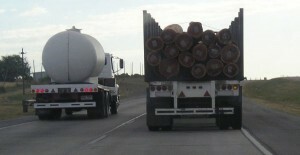 All you know is that it’s overtaking the truck on the left as you can see its indicator. You can’t rely on an indicator accurately indicating a driver’s intentions as they may have left it on accidentally. That’s especially easy on a motorbike or a classic vehicle where the indicators don’t automatically cancel. However, if you see a car indicating, then there’s a strong chance the vehicle will make the manoeuvre. Will this manoeuvre affect you, e.g. by shortening the stopping distance? The other place you need to be aware of indicating is at roundabouts. Many people don’t know the correct indication rules at a roundabout. Many drivers start their manoeuvre and then indicate. This is obviously wrong as the sequence should be mirror, signal, manoeuvre. If you notice someone begin to drift towards the edge of their lane, there’s a chance they might complete a manoeuvre into your lane. Generally (and this is a generalisation that unfortunately rings true too many times), if the car is very expensive there’s a great likelihood it will complete the manoeuvre without signalling at all. I don’t know why this is, but I hope to begin recording my driving and I will count the vehicles that don’t indicate and calculate their value. Until then, though, you’ll have to rely on my anecdotal assertions. Motorway on-ramps are an obvious place where vehicles will be trying to enter the traffic stream. By leaving a gap early you reduce the effect of braking behind you, and the driver can merge like a zip. Everyone gets to maintain a good speed and that keeps traffic flowing more smoothly. This is about driving defensively – you can check out the defensive driving DKT questions here. There are two sets of blind spots when you are driving: your ones and everyone else’s ones. Your blind spots are over your shoulder on both the right and the left. Every time you make a lane change you will check these blind spots to make sure another vehicle hasn’t stealthily moved into them. As you are driving (and this is particularly important if you are a motorcyclist) you should be careful not to driver in other drivers’ blind spots. If another driver can’t see you it increases the risk of them moving into your lane and cutting you off or (worse) hitting you. Check this DKT question about blind spots. The blind spot is approximately the area from the B pillar (this is the door pillar of a car) backwards 3-4 metres, assuming the vehicle is in the adjacent lane on the right. On the left, the blind spot is slightly different. Both your blind spots will be affected by how well you have set your mirrors. Your mirrors should be set so you can see the tiniest sliver of your car in them. If the flank of your car is taking up half the mirror, this is wrong. Move them outwards. If you can’t see your car at all they will be less effective at seeing things that are behind you in your lane. Road signs are there to indicate what you can expect ahead. If you’re coming into an area with a lower speed limit then you should expect that vehicles in front of you will brake. If you’re approaching a crossroads then you should be aware that vehicles might pull out in front of you. There are road sign questions here if you want to check your knowledge.